Sen. Elizabeth Warren (D., Mass.) said "there are two co-equal branches of government" during an appearance on CNN's "Anderson Cooper 360" Tuesday. 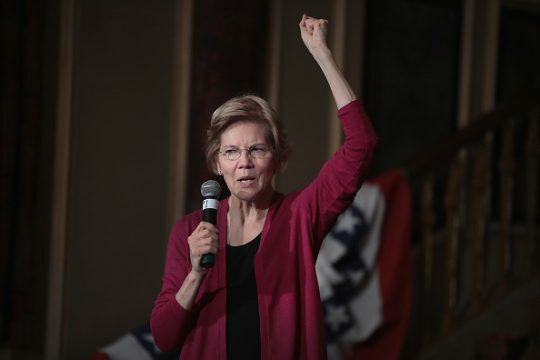 Warren, who is running to be the Democratic nominee for president, neglected to mention the judicial branch while responding to a question from host Anderson Cooper. She also referred to the executive and legislative branches as "the president" and "the Congress." "Do you ever think, look, the realistic endgame is that Republicans get two-thirds of what they want and Democrats have to settle for the shorter straw? Is that how the balance of power works?" Cooper asked. "Well, let's talk about the balance of power. There are two co-equal branches of government, the president of the United States and the Congress," Warren said as she began her response. Warren announced she was forming a presidential exploratory committee in December. Politico reported last week that she was placing top Democratic talent on her campaign. Earlier in the month, it was reported that Warren's Iowa campaign staff consists of several staffers with "deep" experience in the state's caucus. The Democratic field has grown more crowded in the weeks since Warren announced the formation of an exploratory committee. On Wednesday, Pete Buttigieg, the mayor of South Bend, Indiana, announced he would seek the Democratic nomination. Former Obama administration official Julian Castro, Rep. Tulsi Gabbard (D., Hawaii), Sen. Kirsten Gillibrand (D., N.Y.), and Sen. Kamala Harris (D., Calif.) are also running. Former Vice President Joe Biden and Sen. Bernie Sanders (I., Vt.) could also enter the race, along with several other Democrats. This entry was posted in Politics and tagged 2020 Election, Anderson Cooper, Elizabeth Warren. Bookmark the permalink.